Note : If you stay on Gili Islands, we will pick up and drop off in Bangsal! 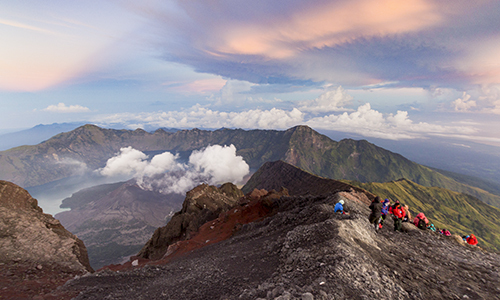 The 2 days Rinjani rim trekking is a great choice if you have a shorter holiday. You may join this great trekking package with the private or sharing for a maximum of 4 people. Our team will do hotel transfers from your hotel in Senggigi, Mataram or Lombok Airport, Bangsal, and Lembar. If you come directly from Bali with a fast boat, we will pick up you at the harbour in Lombok. You will also get free one-night accommodation in Senaru before you start the trekking. And in the afternoon, if you still have enough time, you will visit some waterfalls in Senaru. DAY 01: You will start the 2 days Rinjani rim trekking tracking from Rinjani Trek Centre in Senaru at 07.00am. And then, hike for 5 hours to Base camp III, you will have rest and lunch here. At 03.00pm, you will continue to the rim. 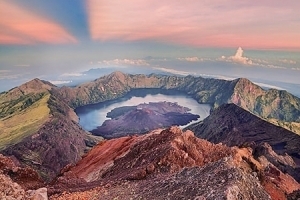 You will enjoy a spectacular view of crater Segara Anak Lake, a new volcanic cone and a beautiful sunset. And then you will overnight here and inner will be served at 7:00 pm. DAY 02: Early in the morning from 06.00 to 07.00am, you enjoy a beautiful sunrise, you will have breakfast. After breakfast, you will back to Senaru. We will spend 4 to 5 hours to reach Senaru, the car is ready for you there and will drive you back to Senggigi. One night accommodation in Senaru, before start tracking.